May 3, 2018 – The 2018 edition of the highly-regarded Chambers USA directory of top lawyers and law firms features Andy Hull and Wayne Turner as two of the six Indiana commercial litigators listed in “Band 1” for the category Litigation: General Commercial – Indiana. Hoover Hull Turner was named to Chambers USA’s “Band 2” listing in the category Litigation: General Commercial – Indiana. Chambers USA ranked seven Indiana firms in this category across Bands 1, 2, and 3. Unlike the other firms, Hoover Hull Turner has a single office and focuses exclusively on commercial litigation. Specialist litigation firm with a strong focus on commercial disputes. Offers a deep bench of experienced trial lawyers with expertise across areas such as ERISA litigation, professional liability cases and contract suits. Clients include large local and national corporations; it is particularly noted for its representation of law firms throughout the Midwest. 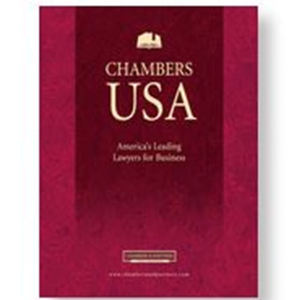 Independent and objective, Chambers USA is carefully researched and widely considered to be the most reputable law firm directory in the world. Law firms and individual lawyers are ranked in bands from 1-6, with 1 being the best. Chambers USA rankings are based on thousands of interviews with leading practitioners and clients from coast to coast. Ranking criteria include technical legal ability, professional conduct, client service, commercial astuteness, diligence, commitment and other qualities most valued by legal clients. To learn more about the Chambers USA 2018 publication or its selection process, visit the Chambers and Partners website.